Road crews remain busy as they prepare for another storm heading to the metro area. During inclement weather, drivers should be on the lookout for tow truck drivers helping haul cars out of a ditch or off the side of the road. LENEXA, Kan. — Road crews remain busy as they prepare for another storm heading to the metro area. During inclement weather, drivers should be on the lookout for tow truck drivers helping haul cars out of a ditch or off the side of the road. "If you see us on the side of the highway, with our lights on, you see us out there working, whether it be a tow truck driver, a law enforcement officer , EMS, firefighters, anybody working on the side of the road, just slow down for us," Jayson Steeley with Santa Fe Tow said. "Move over, give us plenty of room to work — that way we can get home safely at night." 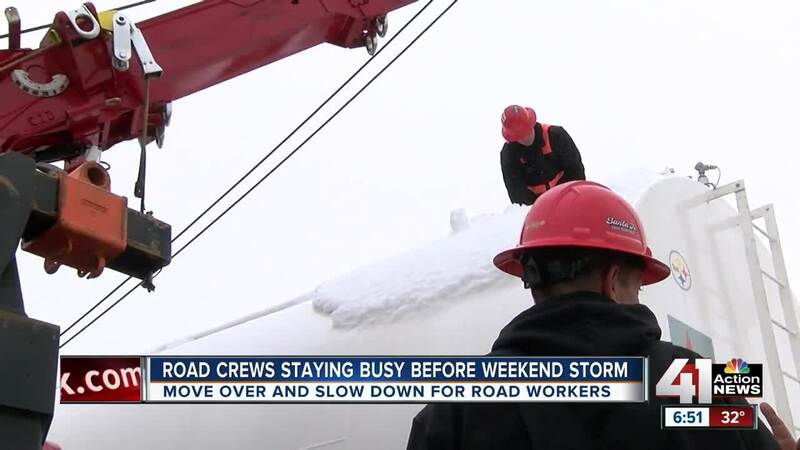 Steeley said during this time of year, when snow storms are in the forecast, crews are very busy handling slide offs, and they want to make sure everyone is safe. "A few months ago, we had one of our own drivers that we lost, and two weeks after that — each week, it seemed after it happened to us. There was a driver that was lost down in the Salina area and then another one in the Kansas City metro area for a different company, so you know it's just too many accidents like that happening and we just don't want to lose any more people," Steeley said. The move-over law applies to drivers in both Missouri and Kansas. Drivers should move over at least one lane if they see an emergency truck with flashing lights.